“Our intentions are to use the opportunity as a ministry...We’re proud of our faith!” says Geston Pierre, a graduate student at the Seventh-day Adventist Theological Seminary at Andrews University in Berrien Springs, Mich. Pierre will be performing in one of ten groups chosen for NBC’s competition series, “The Sing-Off,” a five-night holiday event featuring a cappella singers from around the country. Pierre is one of six singers in Committed, the only Christian a cappella group featured in the event. “The Sing-Off,” hosted by recording artist Nick Lachey, will premier its second season on Monday, Dec. 6, from 8–10 p.m. The competition will continue on Dec. 8, 13 and 15 and culminate in a live finale on Dec. 20 (8–10 p.m. ET each night). Committed is one of ten groups competing for the grand prize: a recording contract with Sony Music and a cash prize of $100,000. The group began as a quartet in 2003 at Forest Lake Academy, Orlando, Fla., and expanded to six members in 2005. Members include Dennis Baptiste, Alain Gervais, Geston Pierre, Robert Pressely, Maurice Staple and Theron Thomas. The all-Adventist sextet debuted at Oakwood University, Huntsville, Ala., for a freshman concert in October 2005 and continued singing at various church and school events in the state and across the country. Committed has performed their biggest gig to date at a United Christian Artists Association Legends Ball in Nashville, Tenn., making “The Sing-Off,” “The biggest opportunity we’ve ever had,” says Pierre. Committed members hail from Alabama, Virginia and Michigan and are all between the ages of 22–24. Five are graduates of Oakwood University and the sixth is a junior music major at the school. 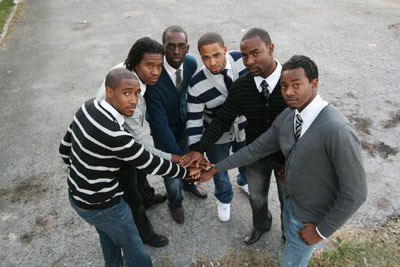 Last year’s series winner, Nota, was also comprised of Seventh-day Adventists who are currently working on their album. Epic Records will release digital tracks of each group’s performance immediately following the airing of each episode. All 10 groups will also be featured on “The Sing-Off: Harmonies for the Holidays” being released by Epic Records on November 30. Look for Committed members to perform in the Macy’s Thanksgiving Day Parade and for their guest appearance on Warner Bros.’ “The Ellen DeGeneres Show” in early December. To learn more about “The Sing-Off,” visit www.nbc.com/sing-off. You can also learn more about Committed on Facebook.